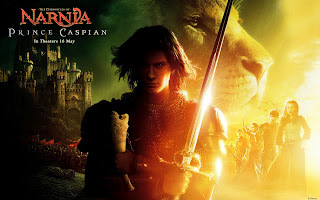 Prince Caspian: Embark on this great fantasy adventure! Chivalry of knights, warriors and kings, talking animals walking on twos and mythical creatures with human EQ--- from the start this installment of CS Lewis’ far surpasses the Lion, the Witch and the Wardrobe.The children Peter, Susan, Edmund and Lucy had just stumbled upon the magical portal. For this installment, Narnia has become sinister and dangerous. There is treachery, murder and distrust among Narnians (the fauns, centaurs minotaurs, dwarves etc). Had to admit when I first saw the trailer, I thought the prince would be the villain. He holds out his hand to the white witch. But after this, he wasn’t after all. That part illustrates how close someone can brush against temptation to release an evil force. But Caspian is actually a rash young man with a kind heart. His uncle is the perpetrator of wiping out all the animals, a warmonger. When Caspian is rudely awakened by his teacher, he had to flee his own home into the wilderness of the night. the actor had no experience riding a horse. The training was worth it, he looks majestic and windblown galloping into the undergrowth! It’s like an invitation into this realm. Hearing men pursuing him, he blows a special horn. This horn was bestowed on Susan, the messenger. That’s why the 4 children who are the Kings and Queens of Narnia are once again summoned to return after such a long time. The train they are boarding disappears into light, when it fades off, the blue sky and waters are revealed. They do not know what has happened until much later when they chance upon ruins. A dwarf becomes their reluctant tour guide. Narnia is no longer the peaceful world they had left behind. It makes me think, are we fit to be caretakers of this one Earth? We’ve left it in disrepair and destruction. Lucy the youngest child, is less of a baby. Her positive spirit is very inspiring. She instantly trusts all the people she meets. Lucy believes Aslan, the great lion, will come and help them all. She has a vision of him. But Peter doubts her, being the realist. Being the High King, he is stubborn that his way is the one. I like the actor, so cute! Such a pity he won’t reprise the role for the next movie. I hope the others will stay the same. “Aslan is not going to come back. We are the ones who will alter Narnia’s future,” is his motto. Meanwhile Caspian has convinced the creatures of the forest to fight on his side to get back what is truly his. In return he will return their land to them. Peter clashes swords with him. He can’t accept that this guy has taken over, and Caspian thinks- I thought you were older! He wonders why he blew the horn since they are greenhorns. The group sneak into the uncle’s castle. Air units, griffins dropping them on the roofs. This is a thrilling sequence and I want to watch it again. So I will get the DVD. Each guard is ambushed by a minotaur, or rats. Brave rats that spring on people with lethal knives. Susan uses her bow and arrows. She’s my favorite! I like archers in the rpg games. Susan is coolheaded and thinks pragmatically before taking action. The prince confronts the uncle why and how his father died. He is threatened on the left by the wife with crossbow. This part is charged with emotion. Peter thought he delayed time so that was why the men were left behind. Another poignant moment is when a brave minotaur uses his body to brace the gate open while they escaped. Then he was crushed underneath it, sealing off the path for the remaining good guys to run. Very tragic, they can’t defend themselves being rained on by arrows. Caspian and Peter argue a lot. They are so similar, two of them hotheaded and youthful. Their characters evolve throughout. During two more epic battles, Lucy runs off to find Aslan. She has faith in him. This is well-rewarded. Aslan is likened to Christ who will save us during our critical time. He brings big reinforcements -trees and floods- to the forefront of battle. I read the book which has fewer battles. So the movie is more exciting. We need to have faith and not do things by our will alone. Courage can help us surpass our weaknesses, if only for the moment! Live in the present and appreciate nature’s beauty before it is gone.